127 mm/51 Mk7 mod. 25 х 1 pcs. 533 mm Triple4 х 3 pcs. 76.2 mm/23 Mk72 х 1 pcs. 127 mm/38 Mk21 mod. 04 х 1 pcs. 28 mm/75 Mk2 mod. 22 х 4 pcs. The Nicholas is a welcome upgrade from the Clemson, and a very fun and strong destroyer for its tier. Compared to the Clemson, the Nicholas is a vast improvement in nearly every way. Perhaps the most conspicuous upgrade is the main battery, which previously on the Clemson was practically the same 102mm armament found on the tier 2 American destroyer, the Sampson, including essentially the same range and rate of fire. For the Nicholas, not only has the caliber been buffed to 127mm and rate of fire increased to a monstrous 15 RPM, the range of the guns can now reach 10.9km away even stock. The Nicholas also gets increased top speed by 2 knots, 8 seconds faster artillery rotation time, and a 0.3 km shorter spotting range. The Nicholas has a fairly tall silhouette due to the tower in the front of the vessel, so once you're spotted you should be more careful as a destroyer's armor is basically nonexistent. Otherwise, the Nicholas is an excellent destroyer for its tier and can be very effective in both assaulting with torpedoes and harassing with its fast firing guns. Monstrous rate of fire at 15 RPM, pairing with 127mm guns, HE spamming from distance is a piece of cake. Torpedoes have the same sped to that of Clemson’s, have 500m more range and deal more damage. AA suite that can rip up some planes at the same tier and most carriers at Tier IV and V will avoid attacking Nicholas. Very wide torpedo launch arc and with 2 triple tubes on each side, 12 torpedoes can be launched at once. Good pool of hit points at 13100 when upgraded. 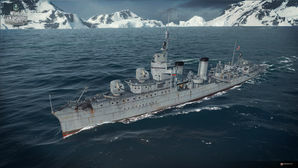 AP penetration is surprisingly good for a destroyer, can give poorly-armored cruisers it face a nightmare when aimed correctly. Fast at 37 knots and reaches up to 40 knots with engine boost consumable used. Just one researchable module, avoids players from getting confused for wondering what to upgrade first. Can use Defensive AA Fire ( ) instead of Engine Boost ( ), excellent for defending against enemy aircraft. Bad armor like any destroyer. Suffers from frequent module incapacitation when hit. AA suite, despite being useful at the same tier, will have a very hard time against higher tier planes. Terrible main battery firing arc from its bow. The stock configuration still has the same long gun reload time of lower tier US destroyers (6.5 sec). Shell flight time is high, making aiming difficult at distance, especially against destroyers. Torpedoes are still short-range (5.5 km) and less that the ship's detection range, making them dangerous to use against ships with lots of guns. HE chance of fire is low at just 5%. Even with the Demolition Expert skill it is difficult to set fires. Hull: Upgrade to Hull (B) for more hit points, a faster main battery rate of fire, and access to Defensive AA Fire ( ). Research of this module unlocks progression to Farragut. Hull (B) is the only upgrade offered to Nicholas captains. Not only does it up her health pool, it replaces her main battery of five 5"/51 mounts with four 5"/38 mounts. This significantly alters the ballistics and velocity of her shells, while also making the main battery dual purpose so that it contributes to her anti-aircraft defense (and allows her to equip Defensive AA Fire ( ) instead of Engine Boost ( ) if desired). The 5"/38 is the standard main battery mount for the rest of the line, so while captains may be tempted to stick with the easier-to-use 5"/51s for their time in Nicholas they are encouraged to begin learning how to effectively use the 5"/38. The Nicholas is based off of a 1919 destroyer leader design that was an enlargement of the older Clemson-class. Envisioned as squadron leaders of "packs" of smaller 1,000 ton destroyers, they were larger and more heavily armed than their counterparts. The design and concept garnered notable interest, but budget cuts to the Navy after the end of First World War resulted in the design's abandonment. The design was given the name "Nicholas" (after Samuel Nicholas, the first officer commissioned in the United States Continental Marines) in accordance with the American tradition to name Destroyers after significant naval figures. Hull (B) depicts the ship in fictional World War II condition. This conflicts with a Fletcher-class destroyer which was also named Nicholas (DD-449) and was in USN service from 1942 to 1970. 1919 design for a 2,200 ton Destroyer leader. This page was last modified on 2 July 2018, at 18:52. This page has been accessed 45,293 times.